Republican lawmakers in Michigan for years have wanted to repeal a law they say makes state construction projects more expensive. On Wednesday, they got their chance. 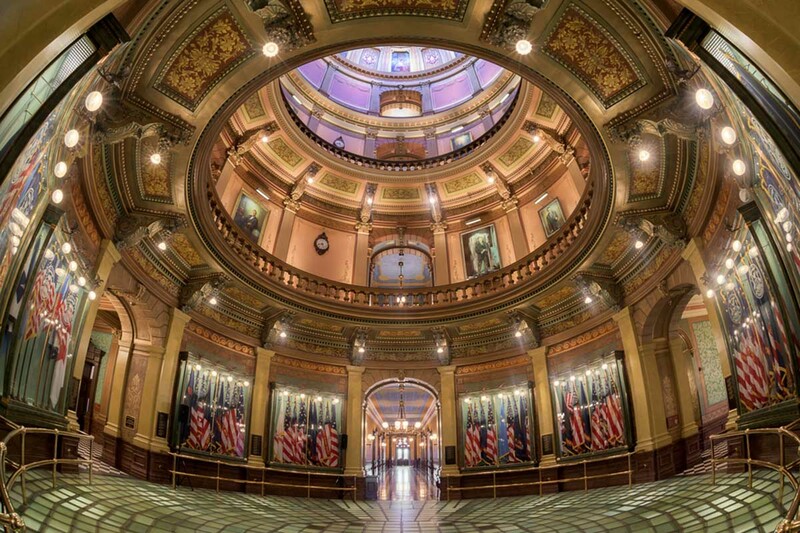 Michigan’s GOP-majority House and Senate adopted a citizen petition to repeal the state’s more than 50-year-old prevailing wage law, which generally requires union-scale wages and benefits be paid on state construction projects. “For the first time in over 50 years, the heavy hand of government favoritism will no longer overcharge Michigan taxpayers to build their schools and public buildings,” said Jeff Wiggins, president of the Protecting Michigan Taxpayers ballot committee, which wanted the Republican-led legislature to handle the repeal. Related: Michigan Republicans won’t pass marijuana bill. Voters to decide in November. The vote was blasted by Democrats and union-backed labor groups, who shouted angrily in the chamber after the vote tally was read. Union groups in the gallery yelled profanities and vowed to vote out lawmakers who voted for repeal. “There are few things more offensive and disheartening to the general public than politicians who speak out of both sides of their mouths,” said Rep. Tim Greimel, D-Auburn Hills. The Senate adopted the petition by a 23-14 margin. All 10 Democrats were joined by four Republicans in opposing the prevailing wage repeal, including Sens. Mike Nofs, of Battle Creek; Tory Rocca, of Sterling Heights; Dale Zorn, of Ida; and Tom Casperson, of Escanaba. The House voted 56-53 to repeal prevailing wage, with several Republicans joining Democrats in opposition. GOP legislators have tried before to pass bills that would have repealed the prevailing wage in Michigan. But their efforts were stymied by Gov. Rick Snyder, who opposed repeal in large part because his administration has been focused on increasing skilled trades careers. The effort this year was led by Protecting Michigan Taxpayers, which recently submitted hundreds of thousands of valid signatures from registered Michigan voters and had its petition certified by state canvassers after the Michigan Court of Appeals ruled in its favor. As a legislative ballot proposal, it first goes to the Legislature for the first shot at adopting it. As a result, voters will not have an opportunity to decide in November on whether to repeal the law. Citizen petitions also are immune from Snyder’s veto. “That is disappointing in some ways. Again, I think that’s one of the reasons that strategy was taken,” Snyder told reporters last week during the Detroit Regional Chamber’s annual policy conference on Mackinac Island. On the floor Wednesday, Democrats urged Republicans to send the petition to the November ballot and allow voters to decide. GOP legislators pushed back against the idea that they were denying the public a voice. The debate over prevailing wage is, in many ways, a debate about organized labor. Opponents of prevailing wage, generally non-union contractors, say the law artificially inflates the cost of taxpayer-funded projects. Union-backed contractors tend to support the law and say repealing it would lower wages and weaken the attractiveness of worker training programs, including apprenticeship and training programs they run across the state. Both sides have data that back up their arguments. Proponents of repeal cite a 2013 report from East Lansing-based Anderson Economic Group, commissioned by Associated Builders and Contractors of Michigan, which represents mostly non-union contractors. It found Michigan taxpayers could have saved $224 million per year — and $2.2 billion in total — on K-12 and higher education building construction from 2002 to 2011 if prevailing wage didn’t exist. That was partly due to an assumption that prevailing wage inflated pay rates by 25 percent, the report says, though its findings later were challenged in a separate report commissioned by prevailing wage supporters. “This is not a partisan issue. This is an issue that can and will negatively impact the workers, the businesses and the economy,” said Tom Lutz, executive board member of the Michigan Regional Council of Carpenters and Millwrights and financial secretary of Interior Systems Local 1045. Union groups fear out-of-state contractors will come into Michigan and bid on public building projects at the expense of quality and safety, while workers in Michigan leave for other states that pay higher wages. Clearly Mr Lutz and Mr Snyder missed their basic econ classes when the relationship of shortages and price of that input was explained. How we acknowledge a worker shortage (we do and across the entire country) and claim to worry about dwindling wages is abject stupidity. Considering the about wages and the claims are this will reduce the cost of projects to the State, we don't need econ classes to let us know how this will work. Reality suits just fine. Or, maybe there's something with the state directly adjacent to us that didn't work in reducing project costs? Clearly you missed the part about scarcity. If demand at a given wage is greater than supply, market wages will increase to draw more suppliers. demise of the union worker to make more money for themselves, they dont care about the little guy, they just want control. All the numbers they came out with were total biased and inflated, and a lot of pockets were linned yesterday. Whats good for personal gain, and wealth. I walked around the Capital yesterday in my hardhat and work cloths and the smugness of the politicians were like noblemen in the movie Braveheart who sell out there countrymen. Seems like the politicians have listened to the citizens, as this legislation was initiated by a citizen petition. "The debate over prevailing wage is, in many ways, a debate about organized labor." Yup. And Lansing keeps delivering bad news to workers. How were they able to get so many petition signatures in the first place? Reducing pay for skilled trades doesn't seem like something citizens would enthusiastically sign. Proponents say there's a job shortage, and that higher wages help attract workers. What? Of course higher wages attract workers. But those higher wages when voluntary allow companies to compete in creative ways. That is what's really best for Michigan workers. There is a sound reason why school mandated training plus on the job measured training are required to become a licensed union worker. The earned proven quality of their work we trust to do a better job on schools and government buildings where our children and the people who represent us spend their time. We depend on licensed trained skilled workers to do better quality work than those who have not gone through the long tested school and measured on the job training multiple year process. Who will trust a non-licensed electrician to wire the school where their children or grandchildren will spend their days in? It has been the mission of this reining Republican Michigan government to minimize the value of unions. Here under that guise they have destroyed the time proven union values that protected homeowners and businesses from shoddy unsafe work. All for their own self interest and those who will cut costs to the bone to get a job thereby putting lives and structures at a shaky stake with untrained unproven workers. Just another misinformation smoke and mirror cloak Republicans put over on Michigan voters who will now be unsafe for the future. Zeke, you have confused two very different concepts. Prevailing wage laws, as they existed in Michigan, required school districts, state and local governments to pay union-scale wages to *all* construction workers, not only to union members. The law didn't require those agencies to hire union contractors, but if they had to pay those higher wages no matter what, most of them did use union shops. BUT, and it's a very big but, participating in a union-sponsored apprenticeship program is not the only way to get certified or licensed in most skilled trades, particularly in the electrician role you cited. Nor is continued union membership a criteria for keeping your license active for those people who were initially trained in a union apprenticeship program. There is nothing in the repeal of this law that allows any government-sponsored project to hire un-licensed electricians to re-wire a school, or un-licensed boiler operators to run the heating plant in that school. What the prevailing-wage repeal does say is that the required rate of pay for those licensed workers will no longer be set by the unions, but by the market. The market is probably not going to be willing to pay $30/hour to a traffic flagger or general laborer, but might easily find that an electrician or master carpenter is worth $50/hr. If there are too few electricians, carpenters, boiler operators, or masons to do all the construction work that private firms, families and government agencies want to do, the rate that project sponsors pay for that work will have to go up. If there are more skilled workers than work for them to do, the rate of pay may go down by a bit. Recent experience in Indiana says that overall construction pay may fall slightly, especially for the least skilled / unlicensed construction workers such as laborers, flaggers, and "helpers" (pre-apprentices). The point you are missing, is that the pay scale is not the only issue. The issue involves benefits, health care,pensions. The GOP legislatures who voted to repeal prevailing wage just screwed over every hard working person that has given their life to the infrastructure industry, now not only have they screwed our families present,but their future. You also arrogantly mention how there are other ways to obtain and maintain training and liscencing, hmmm, wonder where? Oh, I know, from those who wish to profit by taking that from the unions,who actually know what they're doing, to a bunch if digital nimrods who have never picked up a shovel or been in a trench,or ran a crane in the edge of a hillside. Now I'm sure that's where your petition signatures were found. Because they definitely didn't come from the average working taxpayer. Regarding your remark about flaggers,laborers, that issue is something for negotiations, not a deal breaker. Have you ever stood on a freeway in 100 degree or 12 below weather controlling traffic so somebody doesn't get killed, because literally, that's their responsibility. I am disgusted by the repeal, I am disgusted with MITA, and I am disgusted by the contractors that are going non union, it's not about free market, it's about greed, bottom line.